Welcome to those of you joining me from My Dreams of Disney and those of you just hopping aboard. I am the 3rd on our Magical Blogorail. That first trip to Walt Disney World is so special, it's like no other...seeing the Walt Disney World sign for the first time was amazing - first tip have your camera ready so that you can snap a picture of it. Another iconic can't miss picture is a shot of Cinderella Castle, I love going to Crystal Palace for breakfast so you can enter the park early and you can get some great pictures before it gets crowded. Sorry, I am jumping the gun...here are my tips for first time Walt Disney World travelers. 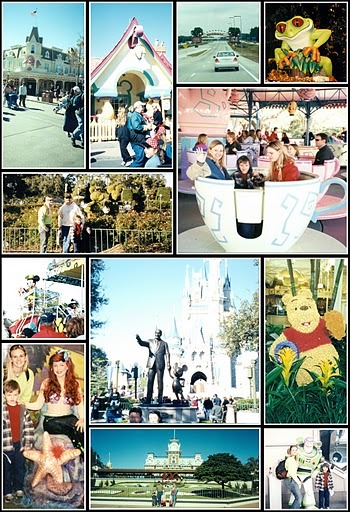 Pictures from our first trip to Walt Disney World January 2003. Fantasyland will sell out FAST. Lots of people will be up at midnight making their reservations, it's a good idea for you to too. Here's a link for making your dining reservations online. Go to at least one Character Meal - there are several to choose from and they are definitely the least stressful way to have your picture made with your favorite characters and get an autograph. FASTPASS - the number one thing I wish I had known about when we took our first trip to Walt Disney World. For the most popular rides they run out early so be sure to get them early. Not familiar wiht FASTPASS just click the link and Disney explains how it works. PhotoPass - I love this service offered by Disney!! PhotoPass photographers are located all over the parks at the prime locations ready to take the family's picture - which means everyone can be in the picture - and they will even take a photo with your camera. You can usually get a discount if you purchase in advance of your trip. Make sure your shoes are broken in - this is not the time to wear brand new shoes you're just asking for a blister and a miserable day. Train for your trip - the average person walks between 6 and 13 miles in a full day at Walt Disney World. Make sure you're ready for it, start a walking regiment several months before your vacation to ensure you're ready for a day in the parks. Keep the young ones on their normal schedule - I realize this can be difficult, but keeping their schedule as close to normal as possible can prevent meltdowns. If they usually have a nap at 1:00 go back to the resort and take a break, all day in the park can be long enough for an adult who isn't used to taking a nap - imagine how it is for a 3 year old. I could go on and on about your Walt Disney World vacation but we have the Magical Blogorail Loop to complete. I will leave you with one last tip - RELAX your on vacation, things happen and schedules get rearranged it's best for everyone if you just go with the flow and enjoy your time. These are some very important tips - especially the one about the shoes and doing some advance training before your trip! It certainly is a lot of walking - but so worth it! Thanks Heidi! It is most definitely worth every step!! A good read, thank you. And your suggestion about doing a Character Meal is a very strong point, not just for newbees but for us veterans as well. It saves a ton of time and personalizes the experience for everyone in the party. My husband and I always train before a trip! So very important. I also have personally witnessed first timers who didn't know about Fastpass. We were in line at the Main Street Bakery (well, the former MSB), and I could easily overhear the mother stressing about being in line and missing the big attractions. I quickly figured out that they didn't know about FP, so I made sure to mention it to them before they left. They were so grateful! Great post!